The Asean Football Federations (AFF) yesterday donated US100,000 (roughly PHP 4.4M) to the Philippine Football Federation (PFF) to help in the ongoing rebuilding efforts for the victims of last year’s super-typhoon Haiyan, locally known as Yolanda. 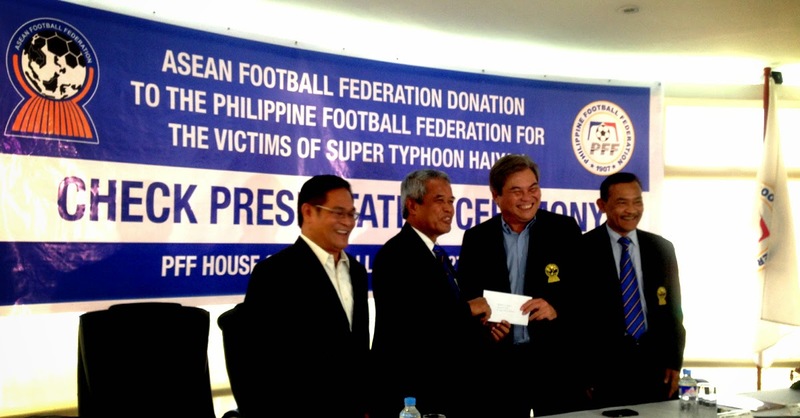 The donation was formally handed over to the PFF at the federation’s House of Football in Pasig yesterday. Representing the AFF were its Vice-President, the Honourable Kalbuadi Lay; Lieutenant General Secretary Dato’ Azzudin Ahman (retired), General Secretary; and Datuk Sri Prof. Dr. Ir Djohar Arifin Husin, President of the Football Association of Indonesia. Receiving the donation on behalf of the Philippines were PFF President Mariano Araneta and General Secretary Atty. Edwin G. Gastanes. The amount raised came from the AFF and from a charity match played last month between the Asean All-Star against the Indonesian national team at the Gelora Bung Karno Stadium in Jakarta. The Adopt-a-School program was selected because of the perceived long term benefits and urgent need for school children to return to normalcy in the aftermath super-typhoon Bopha (locally known as Pablo), which devastated Mindanao late in 2012. The Indonesians won the match on a solitary goal scored by Talaohu Abdul Mushafry in the 13th minute. The All Stars were coached by Datuk K. Rajogopal of Malaysia and included top players from the region including Singapore’s Shahril Ishak, who was voted as the AFF’s Most Valuable Player in 2012. The Philippines were represented by former national team captain Aly Borromeo and former striker Ian Araneta. The charity game raised US$50,000, which was then matched by the AFF Council for a total of US$100,000. The donation is intended to be used for the Adopt-a-School program which aims to replace schools and classrooms destroyed by Haiyan. Data from the Philippines’ National Disaster Risk Reduction & Management Council showed that there were a total of 5,900 totally destroyed and 14,508 partially destroyed classrooms in areas along the path that the super-typhoon took. “The AFF is indeed pleased with the outcome of the match as we have met the intention which has been set, which is to give the idea of an Asean All Stars team a test match and also at the same time give due consideration to the victims of typhoon Haiyan,” said Lt. Gen. Dato’ Azzudin Ahmad (Ret. ), General Secretary of the AFF.